At start, the artist hears about an epidemic of tuba thefts occurring in Los Angeles high schools over the past four years. The school marching bands were missing their lowest resonant instrument. Alison O’Daniel sees this incident as a parallel to her hearing experience. As the tuba thieves would deprive the marching bands of a tonality, her hear misses certain sounds. Her sound universe halfway between deafness and hearing becomes a working hypothesis for figuring this intermediate state between sound and silence. She then launches into the project of realising a film, eight sequences og which are presented in the installation in Brest. The film won’t speculate on the thieves and no tubas will be heard. Poetic associations rise between materials, time, quietness, and listening. 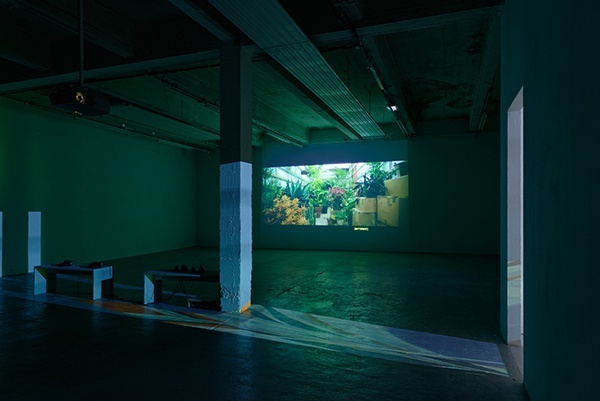 The film investigates the main characters’ differing perceptual perspectives on meditation, longing and loss, their environment, travel, music-making, the past–all in relation to their domestic relationships. 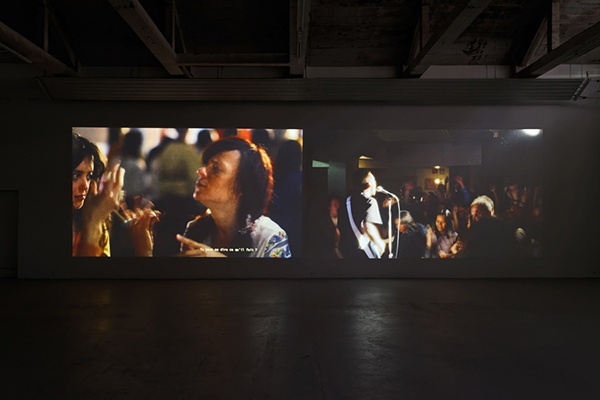 Alison O’Daniel’s approach reverses the usual process of filmmaking by starting with musical scores she commissioned from one Deaf and two hearing composers who experiment with boundaries of sound (Christine Sun Kim, Steve Roden, Ethan Frederick Greene). She presented each with a range of materials (poems, news accounts of the thefts, images, etc.) that served as a “score” for their score. These musical works in turn inspired my production–an attempt to translate these scores into sculptures and a feature length film. As the project evolves, each medium influences the other. The film’s sound is sculptural, visual and tactile, engendering a corporeal understanding of the aural sphere. Sound becomes physical in sculptures I consider “quasi-closed captions” for music, inviting access through material, shape, color, form. The project continues on-going investigation into questions of translation, inviting audiences to imagine other experiences as an avenue through which to understand the story of the film through sculpture and vice versa and also the way the story shifts between the aural and visual. The exhibition is a call to the viewer to become a musician and play a musical and visual score with the works. The oppourtunity to imagine other experiences as solution enabling them to understand the story of the film through sculpture and vice versa. Aure?lien Mole cultivates a dandy artist approach, combining sophistication precision and poetic of the making. His work plays with insight and awareness of both historical and artistic references. 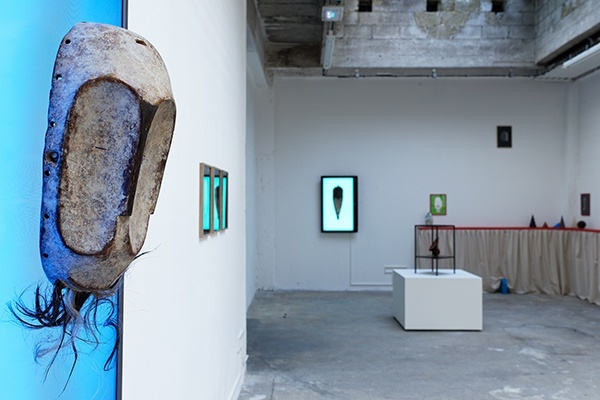 His project for Passerelle Centre d’art contemporain mischievously entitled “Benin”–somewhere between nonchalance and exoticism–deals with history of art and technology especially photographic, as objects of study as well as creation supports. 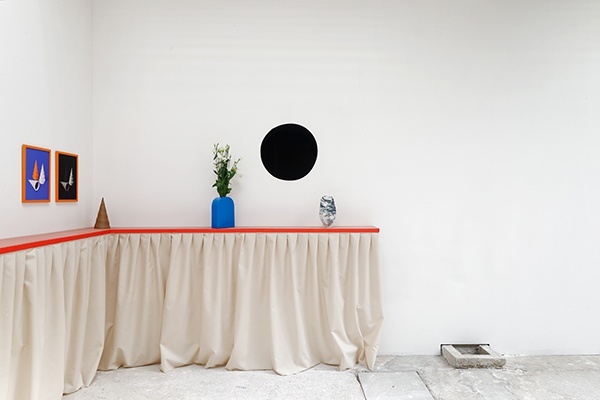 Pursuing Bayard’s experiments, Aure?lien Mole studies and plays with the conditions of appearance of things, with their tangibility in representation and production. 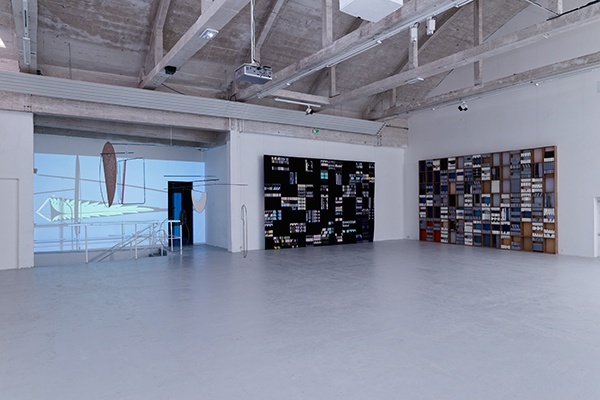 The exhibition deals with a modern contemporary. Modern in auscultating processes of representation and making of objects (serial logic, issues of copy and original, facsimile, delegation of the artist’s gesture, craft movement today, etc.). Contemporary in using today’s techniques and tools like 3D printers or decoy strategies and fantasy facilitated by viral dissemination of images on the web. The display pursues the same referenced and critical logic. Aure?lien Mole deliberately chooses to invest Le Quai. 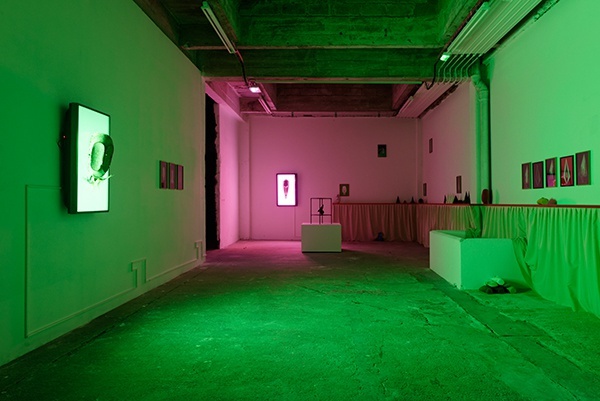 This space is emblematic of a contemporary art venue proudly bearing the scars of the building’s industrial past as a counterpoint to the sacrosanct white cube’s neutralization. The artist obstructs the space with an imposing stage curtain and installs a museum scenography which plays with theater, visual retraction and modern hanging universes. The presentation shelves that level the space in a modern perspective, both elegant and relentless, refer to the famous New York gallery 291. Founded by Alfred Stieglitz and Edward Steichen at the dawn of the twentieth century, the gallery was presenting the pioneering works of the great European masters–Matisse, Rodin, Brancusi and Duchamp–as well as ethnic and archaeological sights. This was also one of the first space of artistic recognition of photography. “Benin” gathers many obsessions of this artist recognized as much for his artistic work, as for his assiduous observation of most exhibitions in France–Aure?lien Mole is the official photographer of many art institutions–and his curatorial practice. UIP 27 is a documentary fiction supposely staged in 2027. 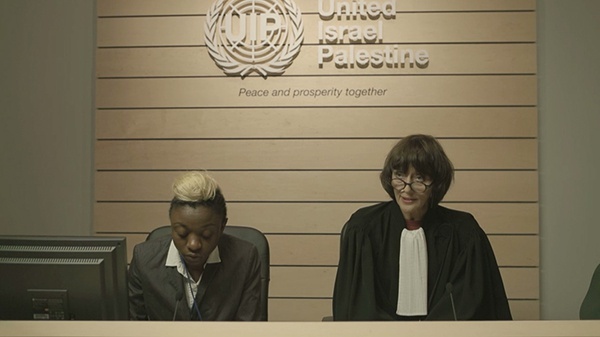 The film is the final form of a participatory and performative project on the conflict between Israel and Palestine by French-Swedish artist Joachim Hamou. Through a series of public debates various aspects of the conflict have been unfolded. This material has been the fundament for a film that was recorded in prolongation of the discussions. 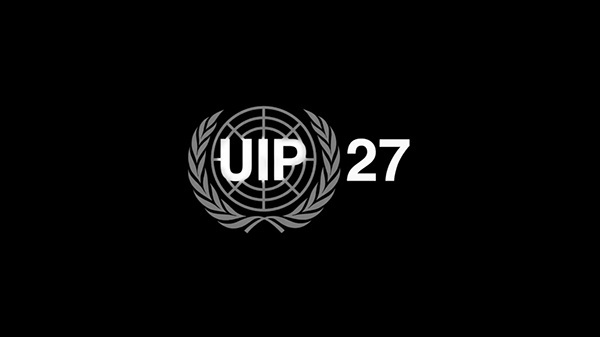 “UIP 27” is an abbreviation for “United Israel Palestine 2027” and refers to a imposed future scenario for Israel and Palestine. In UIP 27 the new occupational power, The United Nations, and thus an international court, handles the conflicts following the constitution of UIP. It is from a juridical perspective that all territories, bodies, ownerships and legacies are considered. In UIP 27 we follow a fictive court case between an Israeli and a Palestinian family disputing land claim and compensations. The intention of UIP 27 is to produce a nuanced narrative on one of the most contentious conflicts today based on the real input from an interdisciplinary dialogue between invited experts, actors and audience. Some scenes have been shot in Brest in Passerelle’s Great Patio in December 2014. Local actors have been involved.